Bundesliga | Rafinha exclusive: "With Philipp Lahm ahead of me, I deserve a medal for 200 Bayern games!" Rafinha exclusive: "With Philipp Lahm ahead of me, I deserve a medal for 200 Bayern games!" 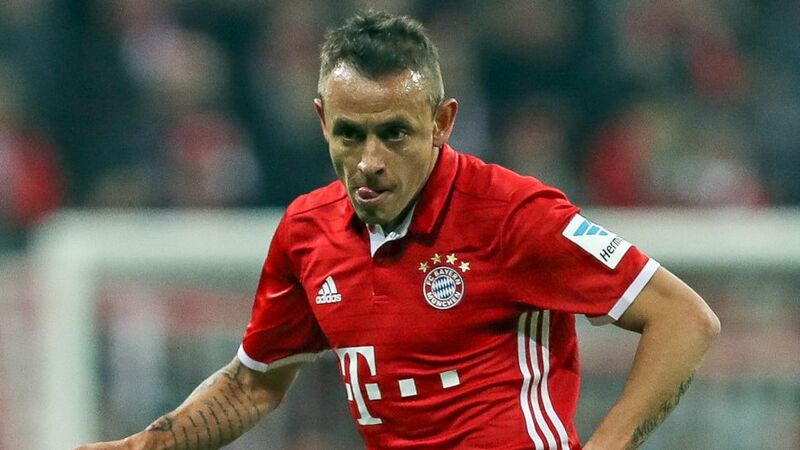 He has made 200 appearances for Bayern Munich, won 15 trophies and played under three of the club's great coaches, but versatile defender Rafinha says he has plenty more to offer in the coming years. Add Rafinha to your Official Fantasy Bundesliga team now! bundesliga.com: Rafinha, how would you assess the 2016/17 season? Rafinha: It's been good, even if I haven't played as much as I would like. I've been competing against one of the best right-backs in history, Philipp Lahm. He never has a dip in form, he's won the World Cup, the Champions League, everything. It's been difficult for me to compete against him. Having said that, I've made 28 appearances this season and we've won the Bundesliga. Personally, I'm happy. Rafinha: It's a big number. I always say that for playing 200 games for Bayern, and with Philipp Lahm ahead of me, I deserve a medal [laughs]! Check out the Bundesliga's Official Facebook page! Rafinha: It's a huge privilege. It's fantastic to work with and learn from men who have won everything as players and as coaches. It's a pleasure to enjoy what they teach us. I'm thankful every day to be playing at a high level and in a team as strong as Bayern Munich. I've been here six years now and have won more than 15 trophies, so that shows I've got enough quality to be with the best players and coaches. bundesliga.com: Under which coach have you been able to make the most of your talent? Rafinha: To be honest, the coach that changed me the most was Pep Guardiola. He taught me a lot and gave me a lot of confidence. I played over 120 games in three years under Guardiola. Some people thought I wouldn't succeed at Bayern but when Guardiola arrived he gave me the confidence I needed, and on top of that he played Philipp in central midfield. Those were three fantastic years and we won a lot of trophies. bundesliga.com: You have made 23 assists for Bayern. Is that your speciality? Rafinha: I'm happy with this season because I've got six or seven assists. I'm not the kind of player who scores goals [laughs]. That's why we have excellent strikers and wingers, so my job is to put good crosses into the box so they can score. bundesliga.com: What can you tell us about your reputation for creating a good team spirit in the dressing room? Rafinha: It's an important aspect. When I arrived at Bayern they thought I was a rough player on the pitch. But gradually that started changing and people would tell me I was nice and told a lot of jokes. That relationship grew over the years. Now I'm happy to be a leader in the dressing room. I've been in Germany for many years and it's crucial to have a good atmosphere in the team because we're together every day. We spend more time here [at the training complex] than with our families. bundesliga.com: How important is it to have a good atmosphere have in the dressing room? Rafinha: We have to remember that we're human beings and we all have problems, but when we're at work with Bayern we should be happy. Obviously it's difficult to maintain that atmosphere every day because we work under pressure, we have to win all the time and we can't make mistakes. That's why I personally try to keep a relaxed atmosphere. I want everyone to be happy and if I see that somebody's down, I'll approach them and ask if I can help. I'm the same even when I'm not playing. I speak to the coach and I ask him why, but in the changing room I always keep up a good atmosphere because that rubs off on the rest of the team. That's why I think it's important. bundesliga.com: Has there been a match you will never forget? Rafinha: There have been lots of important games. I've had lots of good experiences with Bayern, such as winning the Champions League at Wembley. Winning the Club World Cup in Morocco was also unforgettable because it's a really important trophy in South America. But there was one game that I remember. It wasn't a final or a decisive match or anything, but we played against Manchester City in the Champions League and we won 3-1, playing over 1000 passes. The match was at a very high level against players like Sergio Aguero, David Silva, Yaya Toure, Fernandinho and other great players. In the second half we controlled the ball for eight minutes, which was historic. It was without doubt the game I've enjoyed the most and whenever I have time I always watch it at home. bundesliga.com: Lahm is retiring at the end of this season. Do you think you will become first choice right-back? Rafinha: That's up to the coach, but I want to play. I've been at Bayern for six years and I've been waiting for my time to come. I've done well every time I've played and I've shown I've got the quality needed to play. I think my time has come and I'm ready. If I don't play, I'll have to look elsewhere. My aim is to play for Bayern. Next season will be my season and I don't see anyone else other than me playing at right-back. bundesliga.com: What do Latin American players add to German football? Rafinha: A bit of everything. Dummies and creativity I think, because Latin Americans try those a bit more. But also rhythm. We're players who are always in a good mood and that brings a lot to the Bundesliga. Germans are a bit more reserved. German players are very good out on the pitch, but they don't look to try one-on-ones as much, which is what us South Americans love. It's a nice part of the game. Rafinha: I'm Brazilian, but Germany is in my heart. I'm 60 per cent Brazilian and 40 per cent German [laughs]. I've been here for 13 years and this country has done a lot for me. My family, my daughters, my mother – we all love Germany. I can only be thankful for everything this country has done for me. bundesliga.com: You were at Schalke for five seasons and have now been at Bayern for six. What does the Bundesliga mean to you? Rafinha: I love it! I love this league. When Saturday comes it's great to see all the stadiums full and the fans dressed in their teams' shirts, supporting their club. The league will be with me my entire life. I love the atmosphere in the Bundesliga: the preparations, the match, the competitiveness. And it's even better when we win and become champions. It's something you can only feel when you're involved on the inside. It's one of the strongest leagues in Europe. I'm very happy to be part of the history of a club as big as Bayern. Click here for more Bayern news!